Get for free any type of clothings! All restrictions stripped from the menu: now everyone (including pregnant sims, bigfoot, witches, servos) can get clothings for free, plan outfit and change to a different outfit. NOTE: this may lead to some oddities, because there are visual inconsistencies between the Bigfoot body and the human head, or the human clothings and the Servo head, etc. It's up to the player to choose the correctly match the clothings to the sim's head. For example, in this screenshot, Rhonda (pregnant) used the Hacked Coat Hook to select a custom Maternity outfit, Servo used it to change to Formal, Randy (not pregnant) changed to Maternity outfit, and Bigfoot changed his everyday outfit to a human one. Unlocked category "Naked" for buy/plan/change outfit: while this option is basically useless for "Buy..." and "Plan outfit..." (there are no custom clothings marked as "Naked"), the "Change to... Naked" option may be useful for thos players who use the various "naturist" hacks available on the Net. Now the sims correctly reach the Coat Hook placed on every wall. NOTE: this is a hacked object (in the sense that it allows to get results normally not available in a standard game), but it is NOT a global mod or a global hack: it will NOT be unknowingly exported with your lots, and it will NOT affect the sims (except for the new clothings you will "buy" for them) nor any other object existing in your game. Well, we thought that it was time to create an updated version of that dresser; Winter was so kind to let us clone his old dresser (many thanks! ), and we were about to create a quick updated copy of it. Get for Free -> Everyday, Formal, Underwear, etc... - This option will open the same selector you get when you buy clothes on the community lots, but all the clothings have a cost of zero. NOTE: the "Casual 2" and "Casual 3" clothing types are useless: buying them is the same as buying normal Everyday clothings. Change to... - Same as any normal dressers: it allows to change your sims' clothings; Seasons players will get also the "Outerwear" option. Plan outfit... - Same as any normal dressers (includes Outerwear for SSN players). all the custom Maternity clothings correctly categorized as "Maternity". Unfortunately, so far there was no way to change the Maternity outfit, and therefore all the custom outfits around are either "default replacements" or "Everyday" clothings with an added pregnancy morph. The good news is that it's quite easy to re-categorize the Everyday clothings, adding the Maternity flag (you can use the "Scanner" tool of SimPE, or manually edit the Property Set, adding 0x100 to the Category). The Coat Hook is compatible with any game, from the base-game alone to Mansion & Garden; as for Seasons and its Outerwear, there is not a different version for that: if the Coat Hook detects SSN, it will show the Outerwear options. To install the Coat Hook, extract the package from the attached rar and put it in the Downloads folder (or use the Q-Xpress). To uninstall, just remove the package from the Downloads. Seasons owners might find interesting also the "Any-Wear" Coat Hook (you can have BOTH in your game, if you like). 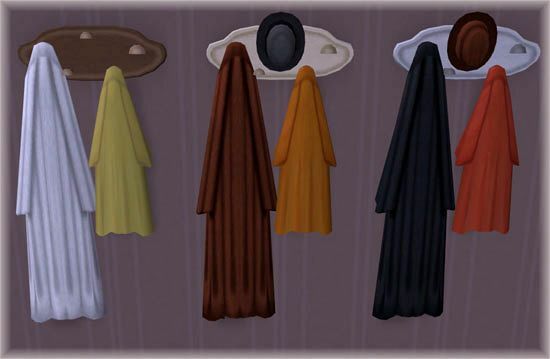 The Coat Hook is fully recolourable; you can recolour separately the clothings and the wood panel, but we suggest to recolour both at the same time, because both parts share the same textures. Please DO NOT CLONE and DO NOT REPOST ANYWHERE. Recolours are fully allowed, but don't include the mesh in your packages: provide a link to this thread, instead.